Whether you are planning a Halloween or Fall party or just looking for cool items for passing out this Halloween, then look no further than Oriental Trading. If you are looking to go the non-candy route, why not get some fun glow products! At Oriental Trading they have flashlights, glow sticks, glow in the dark vampire teeth, glow in the dark shades and so much more! They have so many cool that you can get really creative making your goodie bags for your parties or trick or treaters. These are also perfect for making sure your own kids are seen as they are out trick or treating. Hang a glow stick around your child's neck and their candy bag to make sure you can see them in the dark. My daughter has an upcoming soccer tournament the weekend before Halloween, so I am opting to make each girl a fun goodie bag and of course picked up a number of glow items from Oriental Trading. If you have kids at home they love to help make goodie bags. First I counted out the items and then we set up an assembly line of making them. It was done in no time at all! My son's school has also decided on a no candy policy for parties, so I will be sending some of these cool glow items to school as well. Who can resist glow in the dark vampire teeth or glow shades? 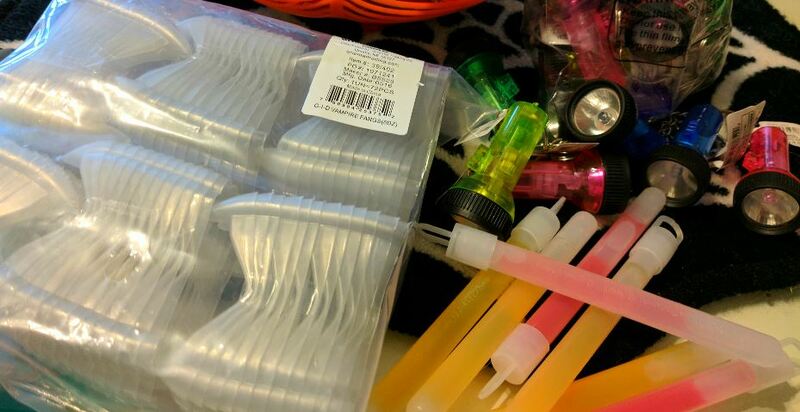 Not only do glow items work in goodie bags, but they are perfect for night parties and games. Do you know Ghosts in the Graveyard? Flashlights are a must for this game and I was able to score some cute ones at Oriental Trading at reasonable prices ! Here are some quick and easy instructions!